This relationship is the real deal, as Sun in Capricorn’s focus on responsibility blends with Moon in Taurus’ unshakeable support. Stability won’t be an problem, but rigidity might. These earth signs will have to work on relaxing the rules so they don’t get stuck in the mud. Sun in Capricorn has a plan, and he works it. Goal-oriented and ambitious, his key to success is setting boundaries and sticking with them. This makes him disciplined, but also defensive (and controlling). Sun in Capricorn needs a partner who respects his authority and plays by his rules. But it’s best if she’s not a pushover (he has no respect for a lover who can’t hold her own). He’s likely to spend much of his time working, but the results (status and success) will be focused on building a foundation for his relationship. He takes his role as provider just as seriously as he does his job. Moon in Taurus needs stability and consistency to feel safe. A domestic routine where she feels comfortable is essential. She’ll be a steadfast partner who creates a nurturing home, but things will have to go her way. Moon in Taurus is quietly set in how she wants things run, and her partner must accept this. Change is not impossible for her, but it must be introduced very gradually. When she feels secure, she can be a strong, sensual partner. 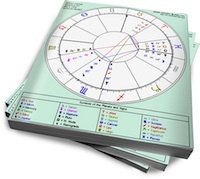 Sun in Capricorn will take care of the external practicalities, while Moon in Taurus handles their home. He’ll appreciate the rock-solid support she gives him, while she’ll feel safe with his unbeatable skills as a provider. After a stressful day at work, Capricorn will find that Taurus’ soothing, resolute influence is the best way for him to unwind. Together, they’ll create a relationship that’s deeply rooted in the material world. The only caution is that they don’t become so deeply rooted that they ignore new growth.